I am very unimpressed by her anymore. It all just seems like game playing and shenanigans. I hope she stays out of the race. Too much baggage and not stepping up when she should've and could've. I still don't think that Palin will make a run for the White House next year. I think that her role will be to promote the republican nominee. This will use her talents to the max. Although some of us have not bought into the bs by the media, I am afraid that a lot of so called independents have and think that she is not qualified to be president. I personally think that she would do a great job. I think that Perry will run and be quiet popular although some in Tx. see him as a rino. She should manipulate the media. That would be better than so many Rinos who let the tables be turned on them in some fashion and end up kowtowing to the "fifth column". Yay! I agree. 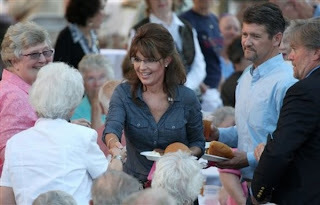 This looks to be Palin's moment. I will either watch this over the Internet, on TV, or in person. Yes, I am considering travelling to Iowa to attend this event, and I am on the West Coast. To paraphrase VP Biden, "this is a big flippin' deal!!!" Topic: "The State and Revolution by V.I. Lenin"
Reading: Chapter Five, "The State and Revolution"
Issues covered in this chapter include Marx's views on the nature and character of the state under capitalism and how this can be transformed under a socialist and communist society. Reading materials for the class will be made available at this session. The class is free and dinner will be served. Palin is yesterday's very old news. She will not run. 2012 belongs to Rick Perry. I wonder if any of Obama's staff plans to attend the class in Detroit. People like Van Jones could teach it. I am sure she will run. I think she actually has a chance at winning. I am not in support of Rick Perry because of some his policies, and attempted policies here in Texas.